Panasonic has developed a new face recognition system that’s pretty impressive. Their technology not only makes it possible to detect (and clearly display) faces in dark or overly bright settings but also if the person in question is behind glass and the face is covered with reflections. The system is based on an LED modulated light source for near-infrared light. When capturing light from the sun (or other sources), only the near-infrared illumination reflected back from a person’s face is processed. LED modulated light isn’t affected by sunlight, meaning the technology can help detect faces in darkness and bright settings alike. 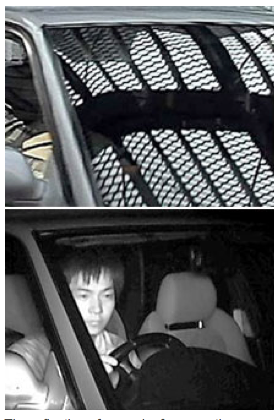 The picture above shows a fence reflected on a car’s windshield on the top, and the same situation when using Panasonic’s face recognition system below. The company says their system delivers monochrome pictures with QVGA resolution. Persons sitting in cars, for example, can be detected as long as the car isn’t traveling faster than 50kph. The system recognizes faces of persons located up to 10m away. Panasonic plans to start commercializing their technology as early as next spring.